Panasonic and Sony end OLED deal to focus on 4K TV | What Hi-Fi? Panasonic and Sony have ended their OLED TV production partnership to focus on 4K Ultra HD TV production in 2014. 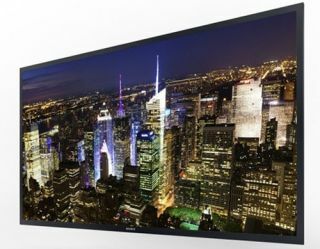 The two Japanese giants had joined forces in an effort to better prepare for mass production of OLED televisions, but it appears neither more efficient and more affordable production methods, nor increased demand for OLED sets, have been forthcoming. Nikkei suggests the companies failed to find a way to make panels durable enough or cut the cost of production. Sony has now confirmed to us that it was always the plan to end this partnership at the end of 2013: "We terminated our joint development agreement at the end of 2013 as originally planned. "In the future, the two companies will continue to develop next generation OLED panel of its own utilizing the results of the collaboration." Panasonic and Sony had been working on different approaches to manufacturing OEL panels, with Sony using a system based on spraying materials as a high-temperature vapour, while Panasonic based its technology on inkjet printing. Panasonic invested around £250m in an OLED production line at its Himeji factory in Japan back in mid-2012 – though this paled in to insignificance compared with Samsung's £2.6bn investment in its OLED business at the same time. Sales of OLED TVs remain low. US research firm NPD DisplaySearch dropped its sales estimates from 20,000 to 5000 in 2014, and from nine million to four million by 2014. By contrast, 60-65 million 4K TVs are expected to be shipped in 2017. Cost is naturally seen as the biggest deterrent to OLED TV uptake, though we expect to see smaller, more affordable sets at next week's CES. The end of the deal will come as the two Japanese companies continue to restructure their ailing TV businesses. Panasonic confirmed its plans to end plasma TV production at the back end of last year, the latest restructuring of the company's television business.